Are we having fun yet?! Good, good. I have been running around the house yesterday and today like a busy bee, very excited that the big day is almost here. I’m taking a quick breather from the Thanksgiving marathon just to touch base and check-in with you all. Hope everything is going according to plan and that you’re enjoying the process. What I am not doing today, however, is sharing a Thanksgiving recipe on the day before Thanksgiving because I know you are all planners and that ship has sailed! Instead, I thought I would give all you super organized and efficient people a great way to use up any leftover turkey you might have on Friday. I always make turkey stock and a simple turkey vegetable soup the day after. I have also given in to chicken pot pie or shepherd’s pie with turkey. But I also think it’s nice to make something on Friday that tastes NOTHING like the dinner you just spent a month thinking about! It’s actually one of my strategies for getting everyone excited to eat leftovers even the day after Thanksgiving. 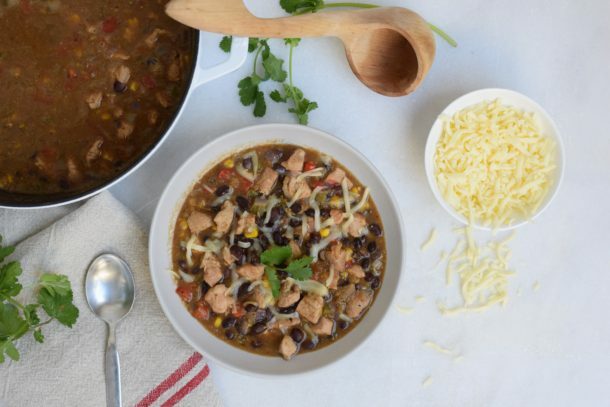 This recipe is inspired by the fabulous chili at the Deer Valley ski resort in Utah. I first skied Deer Valley in 1994 when my husband and I were engaged. He and his family have been going to the resort since it first opened over 30 years ago. It is a really special place and we are fortunate to be able to go there a couple times each year with the kids. Although I enjoy skiing and Deer Valley is absolutely stunning, I’m not super gung-ho about getting out there early and making the most of my day on the slopes. I’m really in it for the food. My favorite part about skiing is building up a good appetite and rewarding myself with a nice hearty lunch. I actually start thinking about this turkey chili when I sit down on the chair lift for the first run of the day! 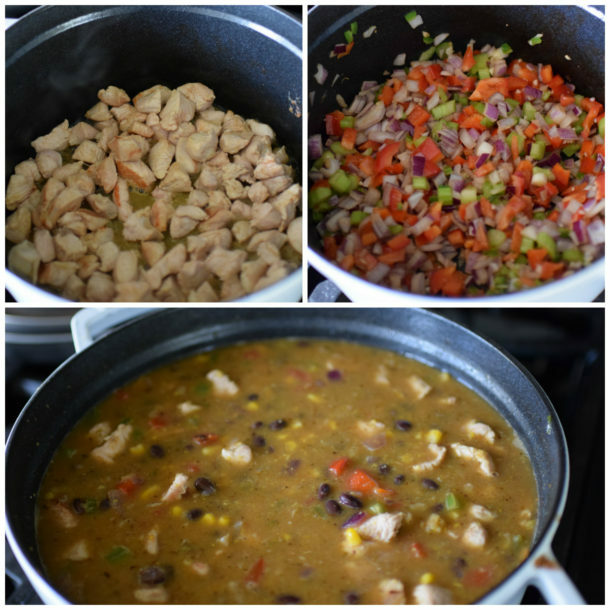 Turkey chili is one of the few items that the resort serves every single day. I happen to notice the the lunchrooms also serve a roast turkey plate every single day. Hmmm, could it be the kitchen needed to find a way to use up yesterday’s roast turkey? Hmmm…. Anyway, we all love this chili because it’s lighter than a beef chili and a totally different take on the typical red, tomato-based ones that are so common. This one is lighter and tastes fresher, perhaps because of all the delicious vegetables. Regardless, all the signature shops on the mountain and many of the local grocery stores sell the special seasoning packet and the dried black beans in addition to the recipe so you can make it at home. 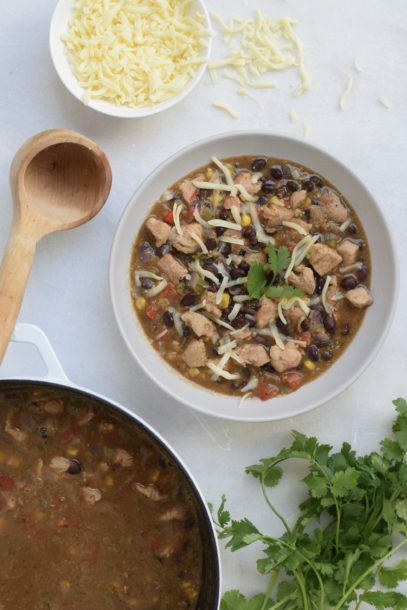 For $7 or $8 plus the cost of the turkey, vegetables and stock, you can make this pot of deliciousness at home. Hmmm….$8 for 1/2 pound of dried beans and a few dried spices. It wasn’t long before I decided I need to figure out what the heck was in that seasoning packet! I can’t say this turkey chili is exactly like Deer Valley’s, but it’s close enough and I’m not sure my kids have noticed. For sure I use half the amount of butter than the recipe calls for and I omitted the leeks, which I think don’t make or break this chili. I also don’t use canned creamed corn, because ugh — canned and creamed and sugar don’t go with corn — so instead I just make a little corn puree. The only ingredient you may not have lying around is masa, which is ground dried corn that’s been treated with lime. It’s what corn tortillas and tamales are made from. 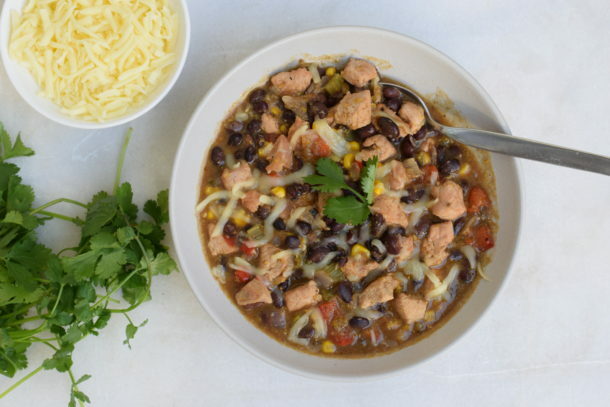 I have to say, it does thicken up the chili and give it a fabulous Southwestern corn flavor. It’s also not an expensive ingredient, so I say definitely go for it. Melt butter in a large pot. If using raw turkey, add half the turkey and sauté until lightly browned. 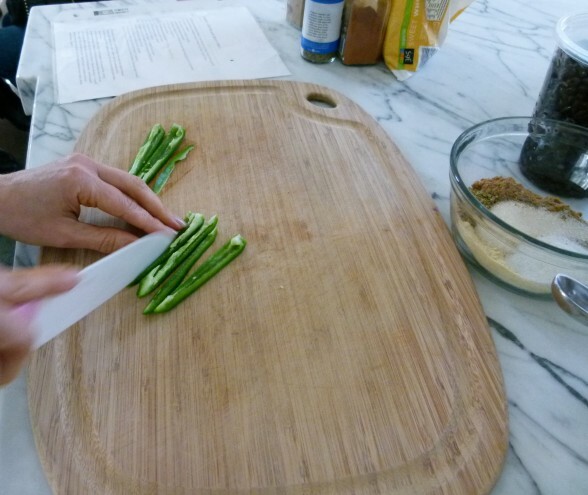 Remove with a slotted spoon to a bowl. Repeat with the remaining turkey. If using cooked turkey, do not saute in butter, but add in step 3. Add the onion, pepper, celery, jalapeno, and garlic to the pot and sauté until tender, about 10 minutes. Add the masa harina, spices, sugar, salt and pepper to the pot and cook, stirring frequently for 5 minutes. Return turkey and any accumulated juices back to the pot. Add 4 cups stock, 1 cup corn and the beans to the pot. 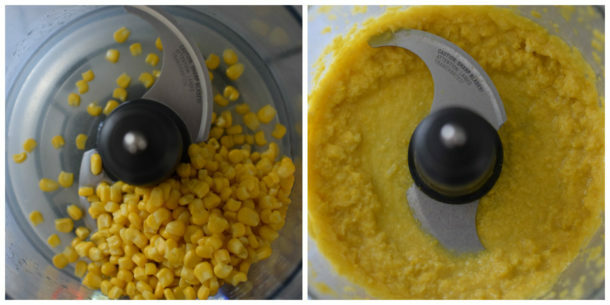 Take the remaining 1 ¼ cup of corn and puree with the remaining ½ cup stock in a food processor (a mini processor works too.) Add the pureed corn to the pot. Mix well and bring to boil over medium-high heat. Lower the heat to a simmer and cook, partially covered for 25 minutes. Serve with desired condiments (sour cream, cheese, minced onion, cilantro) or serve on top of a baked potato. *If you only have stock in 32 oz. containers, no need to open a new one just for a ½ cup of stock. Puree corn in ½ cup water. Oh Pamela! I would be your worst student – at the last minute I added 8 cups of stock instead of 4! But don’t worry, I did not crack into another 32oz’er – I still used half cup water in the corn purée … the kitchen got chaotic with kids and I’m really not sure what I was thinking, but I will let you know how the soup version turns out! Oh man! I’ve been there. It’s so easy to get distracted. I’m sure it will be fine, although maybe not as thick and not as flavorful. But it will be edible! Can I use ground turkey in place of the cubed turkey? Just made this… another winner! Thank you. I like very thick chili and was too heavy handed with the masa. Any tips to salvage? It’s not inedible by any means, just very Masa-y. I would probably add more broth to thin it out. I made this a couple of weeks ago and it was quite yummy. It was such a different type of chili. A nice change. I actually took the leftovers to my mom’s house and they all got to try it too. They thought it was so good. You constantly make me look like such a great cook! What a huge compliment! Thank you so much! I do not like cumin – at all – could i make this without the cumin? any substitution? 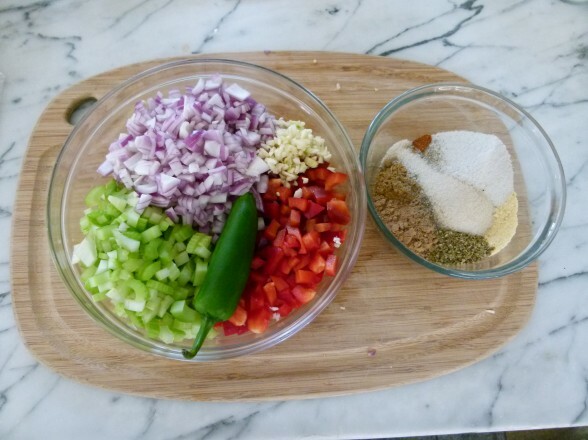 You can eliminate it, but it is a classic ingredient in almost every chili recipe, especially the ones without tomatoes. I would just omit it without substituting anything in its place. Let me know if it turns out ok! Delicious! Cant wait for thanksgiving to have some more leftover turkey! Ha! I always make this Thanksgiving weekend, too. Thanks, Domenica! Bob’s Red Mill is not supposed to be GMO, although they say that it’s hard to guarantee that a GMO seed didn’t fly over from another field, etc. Seriously, that’s what they told me when I called. All I can find GMO free. Hi Pamela! I made this today for dinner tonight (because we just got back from Deer Valley and fell in love with the chili on the slopes! oh. my. gosh!!! So delicious! I used rotisserie chicken because it was easy to grab in the store. I cut way back spices…used chili powder instead of cayenne and used a small amount of jarred jalapenos (which are milder) because I didn’t want to make an extra trip to the store. I also used 2 cans of black beans and 1 can of pinto beans. I know my kids and husband will devour this tonight. Thank you soooo much! Good for you for making this recipe with what you have! I love that. Hope the family enjoys it! Pamela – we are out of town so I wanted to try a family dinner meal. This chili is so wonderful! I used some jalapeño and no cayenne and my three kids ate it. I loved the chili too. My son asked why it was not red, like the chili he is used to. We decided it was because there were no tomatoes. It was was a treat for me to have chili with no tomatoes. Thanks for another fabulous recipe. That’s awesome, Sandy! Just so you know, if you have leftovers, it’s great on a baked potato! Happy new year! This has been a weekly regular since Thanksgiving! It isn’t a hit with the kids (what is!?!?) but having this in the fridge makes quick lunches and weeknight dinners for the adults a breeze. Another *winner* from Pamela! I’m happy that you love it, but I wonder if you cut the spices if the kids would enjoy it, too? My kids are crazy for this! One day maybe! We had this last night and it was incredibly delicious! What a great recipe. I can always trust your recipes to turn out well! Plus they are so healthy to boot! Thanks so much! That’s great feedback, Alex. Thank you!